Pancakes are such great comfort food. Add in a few fresh berries, a drizzle of warm maple syrup, and you've got yourself a fantastic and delicious meal in no time. Go ahead - you're going to love them! In a large bowl, whisk together the flour, baking soda, salt, and cinnamon. In a separate bowl, whisk the water, maple syrup, and oil. Add the liquid to the flour mixture and whisk until just combined. Do not over mix; the batter should be slightly lumpy. Lightly oil a large nonstick skillet or griddle (we love our Lodge Logic L9OG3 Pre-Seasoned 10-1/2-Inch Round Griddle for these) the pancakes come out perfectly golden and slightly crispy. Heat the pan over medium heat. 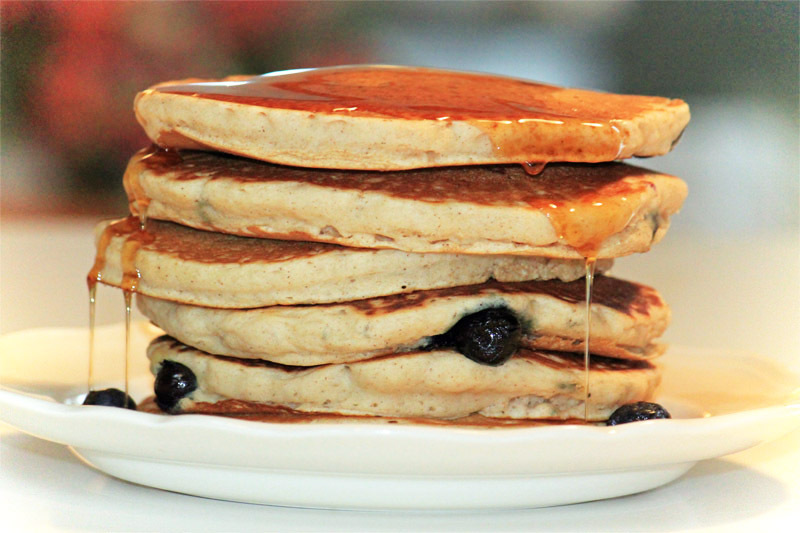 For each pancake, pour about 1/3 cup of batter into the skillet and sprinkle with a few blueberries on top if using. When small bubbles begin to appear in the center of the pancake, it's time to flip it over. Let it cook on the other side until lightly golden and cooked through; about one more minute. Repeat the above steps with the remaining batter, adding more oil to the skillet as needed. Note: If the batter becomes too thick, mix in a little more water, a tablespoon at a time. Set the pancakes on an oven-proof plate and cover loosely with tin foil. Set inside a 225° oven and keep warm until ready to serve. Yield about ten pancakes. You can easily cut the recipe in half, or double it for a large crowd.